Home > Steam Theory > What is Stall? A condition which occurs when the necessary pressure differential across a drainage device such as a trap becomes negative, causing condensate to no longer be discharged from the drainage device and instead to pool inside a heat exchanger. So if a steam system is experiencing any one of these problems, there is a high probability that Stall is occurring. Condensate pooling in equipment can not only affect production quality, but also cause damage to the equipment. Steam traps don’t have the ability to draw out condensate on their own. Instead, condensate is discharged through the pressure difference between the trap inlet (primary) pressure and outlet (secondary) pressure. The trap inlet pressure must therefore be higher than the trap outlet pressure to allow for proper condensate flow. While steam systems are designed to discharge condensate through this pressure differential, various factors can interfere with this mechanism. For example, the use of an inlet temperature control valve can lead to a reversal in the trap operating differential pressure, and cause Stall. Normally, heat exchangers are designed to meet the maximum load that can be expected. The heat transfer surface area of a heat exchanger is fixed and cannot be changed, but the load fluctuates depending on the operating conditions. For example, if the flow of air in a hot air heater is reduced, the only way to maintain the current temperature of the hot air is to reduce the temperature (pressure) of the steam being used as the heat source. If the amount of valve opening on the temperature control valve is throttled down toward fully closed, the pressure inside the heat exchanger will drop. As a result, the trap inlet pressure will drop and become lower than the outlet pressure, and condensate will no longer be discharged from the trap, but will pool inside the equipment. In a steam-using hot air heater system, control valves, temperature sensors and controllers are used to regulate the pressure and maintain even temperature. The above animation is an example of such a system. Steam at 0.3 MPaG (44 psig) is used to achieve hot air at 80 °C (176°F). Stall often occurs in this type of situation. The heater first starts at room temperature. Steam regulated by a control valve supplies the necessary heat required to reach the target temperature, in this case 80ºC (176°F). As temperature draws close to 80ºC (176°F), the control valve opening is reduced, reducing steam pressure and the supply of heat. As air is heated, the steam pressure and temperature within the heater begin to drop. Heating air with low pressure steam causes the pressure within the heat exchanger to drop even further. This can result in insufficient trap operating differential pressure and cause condensate to pool inside the heater. The control valve then responds by opening further (increasing the steam pressure), and the pooled condensate is discharged. The cycle then repeats itself, causing condensate to pool whenever the trap operating differential pressure is inadequate. Even though pooled condensate can be eliminated by restoring the pressure at the trap inlet (primary pressure), problems still occur during the time it takes for the inlet pressure to recover and discharge the pooled condensate. Stall conditions can foul equipment, affect product quantity and quality, and cause severe damage from water hammer, including damaged tubes and channel head gaskets. Water hammer can occur if steam comes into contact with pooled condensate and instantly condenses because of the difference in temperatures. In equipment that has narrow tubing such as the shell and tube heat exchanger in the illustration below, the impact of water hammer on the tubing may cause the tubing to rupture. 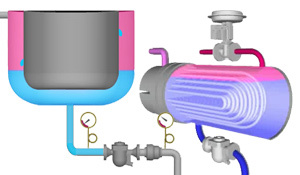 For more details on Water Hammer, please visit the: Water Hammer Tutorial. Stall that occurs in equipment such as jacketed kettles can lead to serious problems of uneven product temperatures. Merely replacing the trap does not prevent the occurrence of Stall because it will not resolve the negative pressure differential that occurs across the trap. Reducing trap outlet (secondary) pressure.